In shallow glass or plastic dish or resealable plastic food-storage bag, mix all ingredients except chicken. Cut and discard any fat from chicken with kitchen scissors or knife. Rinse chicken under cold water, and pat dry with paper towels. Add meat, turning to coat both sides. Cover dish or seal bag and refrigerate at least 8 hours but no longer than 24 hours. Brush grill rack with vegetable oil. Heat coals or gas grill for direct heat. Heat to MEDIUM heat, which will take about 40 minutes for charcoal or about 10 minutes for a gas grill. Place chicken breast on grill. Cover and grill 15 to 20 minutes, turning once with tongs. If desired, brush chicken with remaining sauce during the last 5 minutes of grilling. 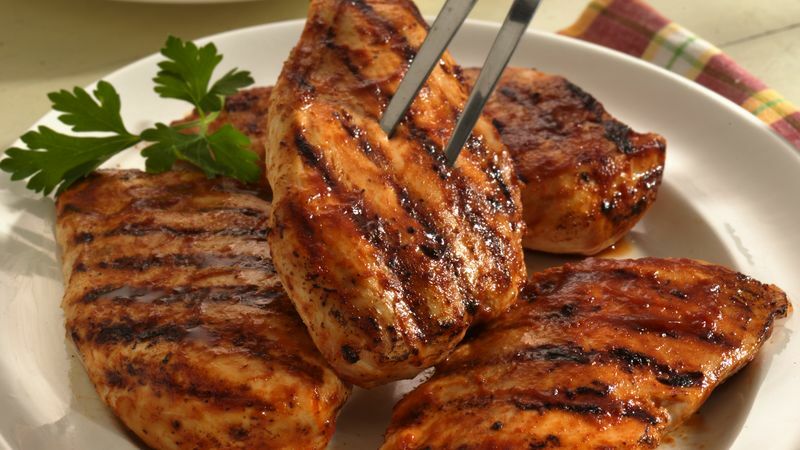 Grill until juice of chicken is no longer pink when centers of thickest pieces are cut.